Submission Format: 6 page paper in Extended Abstracts Format, a 5-minute video clip in MP4 format, and proof of all team members’ student status. At the Conference: Accepted submissions will participate in a juried poster session. 4 teams will then be chosen to advance to the next round which will involve giving a short presentation. This is the 14th year of the CHI Student Design Competition. The Student Design Competition continues to grow each year with increased international representation. The competition always draws a large audience at CHI and has also become a major recruiting opportunity for identifying talented students. Last year, there were 69 international submissions from about 15 countries. With your entries we hope to continue this trend in both submission numbers and quality and make the CHI experience exciting, innovative, and attractive. What is the Student Design Competition? Provide an opportunity for students from a variety of design backgrounds (HCI, industrial design, product design, visual design, interaction design, etc.) to participate in CHI and demonstrate their problem solving and design skills in an international competition against their peers. Computer interface design is typically performed in service of needs shared by broad swathes of the population—objects and services that can be produced and delivered in mass quantities, and that can be used by many people, in myriad settings. That approach is a cornerstone of how industrial economies work, and has yielded many successes. Unfortunately, this model of technology development often neglects populations who present needs outside of the norm—folks who, for a variety of reasons, cannot utilize these mainstream technologies. Assistive Technologies are design interventions to serve users that present different and often challenging needs. These users may have sensory difficulties like blindness or deafness, or they may have a physical condition that prevent them from speaking or a motoric impairment that preclude their operating devices in a traditional way (e.g., tremor or paralysis), or they may present one of myriad cognitive syndromes that make their lives a challenge. A huge opportunity exists to do good things by applying our design skills to these populations, all the way down to specific individuals, who present different needs and abilities. Further, specific settings of use can also complicate matters and make a commodity technology inappropriate for use in a particular instance. Alongside these user- and setting-driven considerations, the means and forces of production have changed in ways that allow designers to focus in on particular user needs and work with the demands and opportunities that crop up. At some level, all technology is assistive technology. As well, each of us, at some moment, probably exhibit some sort of impaired ability. You may get some traction by taking that sort of definitional interpretation of the challenge. In fact, one of the facets of this design challenge is for you to select a demographic and situation that you feel passionate about, that you believe will resonate with the CHI community, and where you believe you can make a real and significant contribution. Having direct access to an individual or community of people you can design with and for may factor heavily into your choice of focus—this is not a challenge where you’ll likely have a good result if you simply imagine what life is like for your users or if you design for yourself. 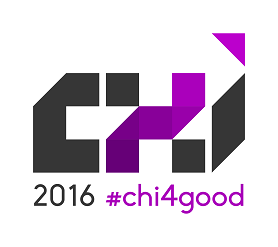 The theme of CHI 2016 is “doing good.” We want you to operationalize this theme by creating an Assistive Technology. You could adopt a inclusive design strategy that allows someone with a sensory impairment to more effectively use an existing technology. You could just as validly create an all-new technology that offers opportunities for the disabled to participate in a domestic or public setting, for work or for play. You may want to be very specific (e.g., a non-vocal individual participating on a debate team or at a poetry slam) or more general (e.g., a blind person navigating an unfamiliar part of town (after having been dropped off by their self-driving car service)). You can apply what we know about social networks, gamification, the internet of things, wearables, or hacker spaces. You may investigate why specific groups of individuals face more challenges and then experiment with ways to overcome those challenges. You may address specific challenges in an occupational setting, or with mobility, or in learning, or with living independently, or in entertainment – choose you own or do something that crosscuts all of those. You may come up with an inclusive design approach that makes existing technologies work for a broader set of users or you may find opportunity in emerging technologies (e.g., 3D printing, nanotechnology, modular robotics, drones, wearables, programmable matter, or whatever). Push the envelope…expand the discussion and the possibilities…empower people! Does your Assistive Technology address a real problem? Does the solution use technology in a novel and creative way? Were relevant prior works properly identified and cited? Were analysis, synthesis, design and evaluation sufficient and systematic? Was the Assistive Technology developed far enough to demonstrate the ideas? Were real stakeholders involved in the process of development and evaluation? Was the solution well-crafted and effectively presented? Teams must consist of at least two, but no more than five students. There is no limit to the number of teams that may compete from any given University or organization. However, one student cannot be part of multiple teams. Submissions are invited from all students at all stages of their university careers, from undergraduate to postgraduate. While not a mandatory requirement, it is strongly encouraged that the teams put forward a multidisciplinary, multi-national team. Extended Abstract. Teams will submit a non-anonymized paper (6 pages maximum) written in the Extended Abstracts Format summarizing their design solution and its evolution. Submissions not meeting the page limit or formatting requirements will be automatically disqualified. This document should be submitted as a single PDF and the file must be no larger than 4 Mb in size. Poster. The poster design should be reduced to one standard letter page in size and submitted in PDF format and the file must be no larger than 6 Mb in size. Video. Teams must provide a supplementary video (MP4 file, max 5-minutes), with a file-size no larger than 100Mb, illustrating how your solution fits the lives of the users with the help of scenarios. It may also illustrate some details of the interface and the information presented. Please refer to the Video Showcase section for guidelines on the video submission. confirmation that you are currently registered in an academic program full-time (that at least 50% of their working week is spent following an academic course of study). Participants must be students pursuing an academic degree at the time of initial submission (Fall 2015). Transcripts or scanned IDs will not be accepted as a proof. All students must provide proof of their student status by the letter mentioned above. Each team must provide one proof package (a single file containing scanned signed letters for each team member) together with their project submission. The competition follows a three-round process. Each round focuses on communicating the team’s ideas through a different mode. Teams will submit a short paper in Extended Abstract Format (six pages maximum) summarizing their design solution and its evolution. Teams must provide supplementary material in form of at most 5-minute video. The video may illustrate how your solution fits the lives of the users with the help of scenarios. It may also illustrate some details of the interface and the information presented. Expert reviewers will evaluate submissions and a maximum of 12 teams will be selected to attend the CHI conference. All submissions must be in English and must include title and author information, including author affiliations. Please be sure that submissions do not contain proprietary or confidential material and do not cite proprietary or confidential publications. Due to tight publication schedules, revisions to the extended abstract will not be possible. The submitted PDF version should be camera-ready final version. Student Design Competition authors will be notified of acceptance or rejection by 29 January, 2016. Authors of accepted submissions will receive instructions on how to submit the publication-ready copy of their Extended Abstract, Poster Design, and Video. Publication-ready submissions are due on 5 February 2016. Accepted teams are expected to attend the conference. Submissions selected for round two of the competition will be evaluated during a poster session at CHI 2016. A scheduled 80-minute poster presentation event will take place during the conference. Accepted teams are expected to attend the conference to give a poster presentation outlining their design, and discuss their proposed solution with a panel of Student Design Competition Judges. Based on the results from the poster session, the judges will select four teams to present their proposed solutions orally during a scheduled presentation session named “Student Design Competition Final”. Teams will be also provided space in the convention center to display posters and discuss their proposed solutions with the CHI 2016 attendees. Each poster will have a display space approximately 8 feet wide and 4 feet high. The poster is expected to follow the International Standards Organization (ISO) poster size format (A0). The dimensions for A0 format are 84cm x 119cm, or approximately 33″ x 47″. Either landscape or portrait orientation is acceptable. The top four entries to the Student Competition earn a Certificate of Recognition. The winning entry will be recognized during the closing plenary session of the CHI 2016 conference. Winners will be announced during the closing plenary. Each team’s short paper submission will be reviewed by both academic and professional design and usability experts. 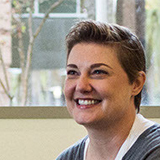 Use of appropriate design methods such as ethnography, contextual research, phenomenological/autobiographical methods, secondary research, reflection, critique, analysis, and empirical evaluation. Clarity and credibility of design focus, purpose and solution relative to the posed challenge. Originality and quality of the design solution, including claims and their supporting evidence. Innovation within the design process. Clarity of extended abstract and supplementary material. The posters will be displayed the whole time, but usually authors are expected to be by their posters for one or two specified break periods so people can ask them questions.